It is saved because it is a consumable item because it is cheap. Used to correct writing task. I am using it for many years, but it is easiest to use. Because it is usually used, conscientious price is appreciated. If you say eraser it will be a thing! Ease of use is outstanding. It is a commodity that you can buy in bulk at ease. Because it is a writing instrument to use on a daily basis, it can be purchased inexpensively from other places and it is saved. A little after the free shipping! It is useful at times. 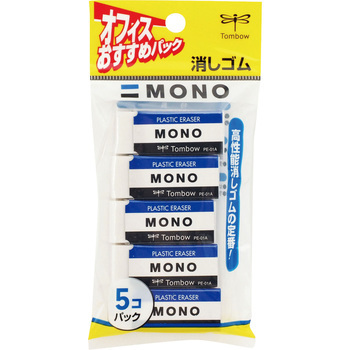 I like MONO eraser before but MoNoTaRo is very helpful because the price is cheap. I think that it disappears well and softness is moderate. Because all employees use it, it is bulkier than Cosa as well as individual packaging. It is easy to use because the material uses moderately soft rubber. It is good that the standard product is able to purchase cheaply. Although it is a standard eraser, the price was cheaply purchased. It is a good eraser.